with photos by Richard and Julie Blanford! 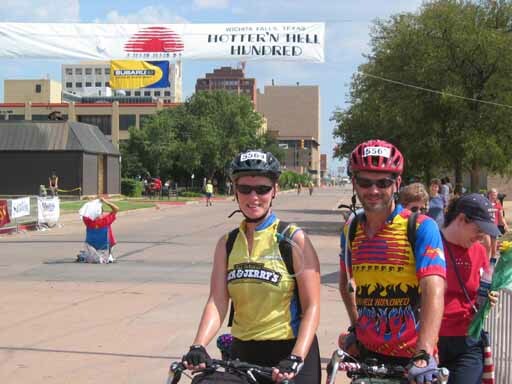 August 23, 2003 - Saturday This year's Hotter N'Hell was special. We rode a century for the first time. 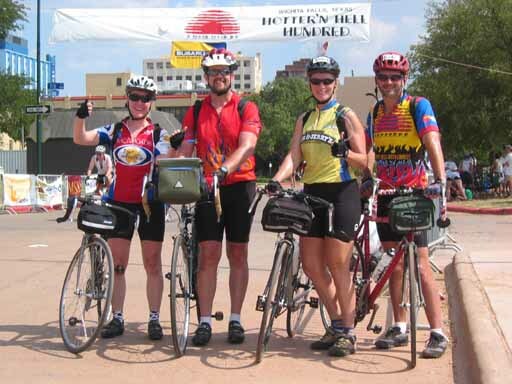 Richard and Julie cajoled us into doing the century (well, really only me, Anne was ready to go from the beginning!). RonMon broke a rib and was unable to go, so Richard agreed to slow down enough to lead the way for us. This year we stayed at the Travellodge in Wichita Falls, TX. This turned out to be a _very_nice_ place, and very close to the start of the ride. We drove up on Friday afternoon and checked in. Since last time we visited, the bypass over Wichita Falls was completed and we zoomed over the top of the city and out the north side. The Travelodge was just north of town, on the east side. 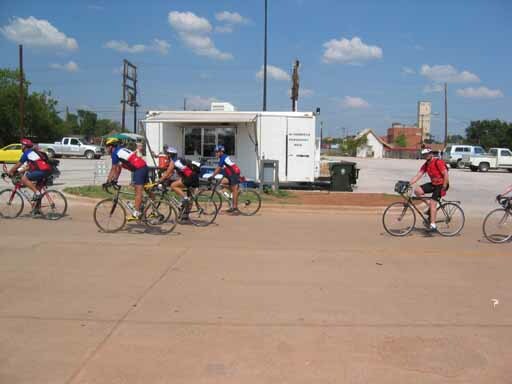 This is about 2 miles from the start of the ride in downtown. The staff was very friendly. They also had left all kinds of goodies in our room! Bananas, muffins, energy bars, other stuff. There were lots of HHH bikers there, probably mostly bikers. The parking lot was full of cars and SUVs filled with bicycles. The next morning breakfast was in the breakfast room off the lobby where they had fruit, muffins, toast and jam, cereals, coffee. Nice. We biked over to the starting line. The ride started at 7am, still dark. They had about 8000 people there. They no longer have the race so the start is easier, with the tandems going off first. Since we were in the century riders we were closer to the front and got started earlier. We ended up standing a little out of the main group, near the television and radio coverage. Richard got some digital pictures , then managed to talk the media people to lift him up in the fork lift way, way up over the crowd where he took some pictures and movies. Cool. The day was very nice, warm but with little wind. This ride can be a killer with the heat and wind, but it wasn't so bad this year. We all tucked in behind Richard and he dragged us most of the way. 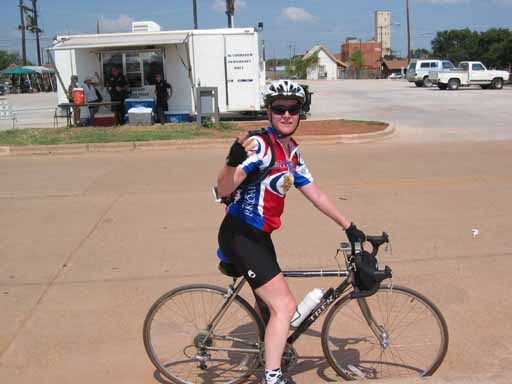 Julie was reluctant to stay in close early on, but the ride beat her down after a while. 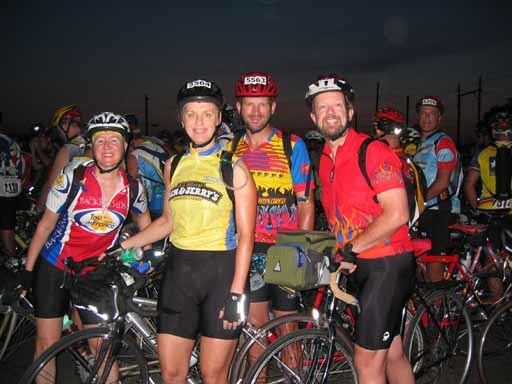 Here is Richard and Julie at the 20 mile rest stop. 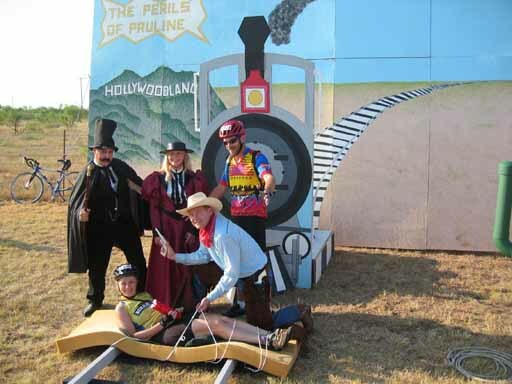 The theme was "The Perils of Pauline" this year. We heard about Hells Gate, but never experienced it. We expected a big banner, like a starting line banner, with lots of fanfair. But it wasn't like that. It was not well marked. There were lots of orange cones marking the route. It seems that the cones are setup one way prior to 1:30 pm, then are moved to force everyone after 1:30 pm to "cut the corner off" and do the 62 mile route. 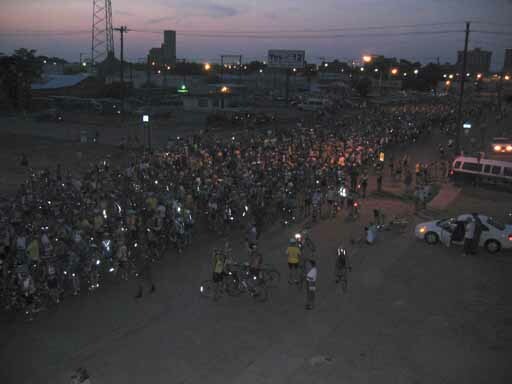 They do not want people doing the 100 mile route to end the ride after dark! After Hell's Gate the rest stops increased in number. They were every 10 miles before HG, then were every 8 miles or so after it. Thank god for that. It was hot, we were tired, and close rest stops really helped. The route is clockwise, heading out west, then north, then a very long stretch of east, then south, finally back west into town. The south leg is the hardest. It is afternoon, the heat is terrible, and usually there is a strong south wind. At the last few rest stops we met a lot of people that were having a very difficult time of it. Lots of cramping and dehydration. People were sitting at the rest stops under the tents staring off into space, trying to pull themselves back together to go on. Most everyone _did_ go on, it was a mental thing. Just before the last rest stop Julie and Anne ate their Goo packets. Julie got an immediate burst of energy and she and Richard took off like rockets. We didn't see them again until the end. Zoom! Stewart keeps fighting leg cramps during the long rides. For the HHH he brought along salt tablets and took them at the 10, 20, and 40 mile rset stops. He didn't get cramps until 80 miles (they usually happen around 50 or 60 miles). He probably should have continued to take the salt. It wasn't much of a problem anyway, the cramps were not bad. It took us 8 hours 30 minutes to bike 106 miles. At the end Richard and Julie were standing around the finish line taking photos and movies. Here is Stewart and Anne crossing the finish line. Here's our group shot! We all felt good at the end. Not everyone felt so good. There was this buff, tanned, young guy in the back of a truck with eyes like Dorian Gray incoherent, drooling, having some kind of spastic attack. They were dragging him off to the first aid tent where IVs awaited. We saw a _lot_ of people past the 80 mile point sitting in the grass off the side of the road waiting for someone to pick them up and carry them back in. They were done. We biked back to the hotel. When we got back to the room to take our naps, it was difficult to sleep. Both of us had serious tingling in our feet, uncomfortable. Anne had numbness in one of her hands. Stewart's legs cramped up as he cooled down. Also the Goo must have a lot of caffeine in it. Friday dinner was at a steak house near downtown where we met some friends of Julie and Richards. Saturday night after the ride, we drove over to an Olive Garden on the southwest side of town where we ran into some others that had done the ride.